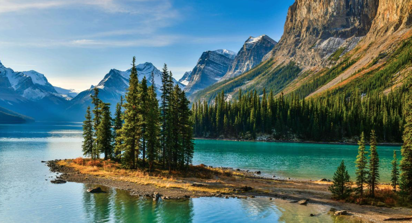 This breathtaking 10 day scenic drive in the Canadian Rockies takes us through boundless wilderness with some of the most picturesque mountain-scapes in the country. The route encompasses one of the “top 10 drives on the planet” according to National Geographic. 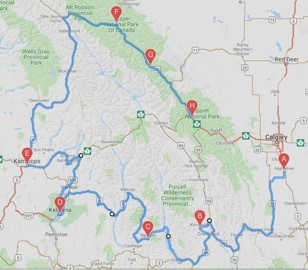 The route has been carefully selected for driving enjoyment, with ample opportunity for Rest Stops and Photo Ops, Points of Interest and Tourist attractions. Each day travelers have the option of taking the prescribed route or choosing their own path to visit additional attractions, or for faster arrival to the next destination. With breathtaking scenery, and a variety of sites and attractions, this trip promised to have mass appeal. There are 6 overnight destinations, three of which include 2-night stays, offering opportunities for rest, relaxation, and exploration and enjoying the local scene. Accommodations are rated 3-stars and greater with positive reviews on travel sites. Every attempt will be made to accommodate the group at a single location. The estimated cost of accommodations is $1500.00 CDN per person based on double occupancy. Adjusted rates may be available at some locations for families travelling with 3 or more members. Food and fuel are not included in the estimate. Total distance of the planned route, Calgary to Calgary, is 2067 Kilometers or 1285 miles. Accumulated driving time of the planned route is 26 hours over 10 days. Planned daily drives vary between 172 and 441 kilometers / 107 and 274 miles. A Few Tourist Attractions Along The Way. Please email Expressions of Interest to events@bmwcsa.ca no later than February 28th, 2019. The September 6th to 15th trip will proceed with a minimum commitment of 10 cars/10 rooms, and the trip will be capped at 15 cars/15 rooms. BMWCSA trips generate wonderful memories and extraordinary friendships.